Sub: Clarification regarding issuance of passes on longer route to destination, if this longer route happens to be quicker than direct route. 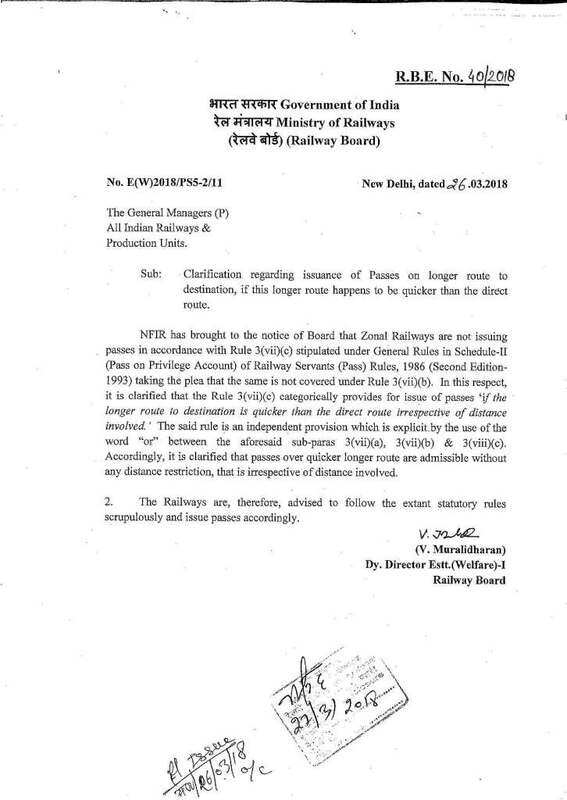 NFIR has brought to the notice of Board that Zonal Railways are not issuing passes in accordance with Rule 3(vii)(c) stipulated under General Rules in Schedule-II (Pass on Privilege Account) of Railway Servants (Pass) Rules, 1986 (Second Edition-1993) taking the plea that the same is not covered under Rule 3(vii)(b). In this respect, it is clarified that the Rule 3(vii)(c) categorically provides for issue of passes ‘if the longer route to destination is quicker than the direct route irrespective of distance involved.’ The said rule is an independent provision which is explicit by the use of the word “or” between the aforesaid sub-paras 3(vii)(a), 3(vii)(b) & 3(viii)(c). Accordingly, it is clarified that passes over quicker longer route are admissible without any distance restriction, that is irrespective of distance involved. 2. The Railways are, therefore, advised to follow the extant statutory rules scrupulously and issue passes accordingly.